Step 1: turning the model sideways and moving the arms upwards. Step 2: Since Speedy didn’t need legs I simply folded both legs together completely using the pose tool. 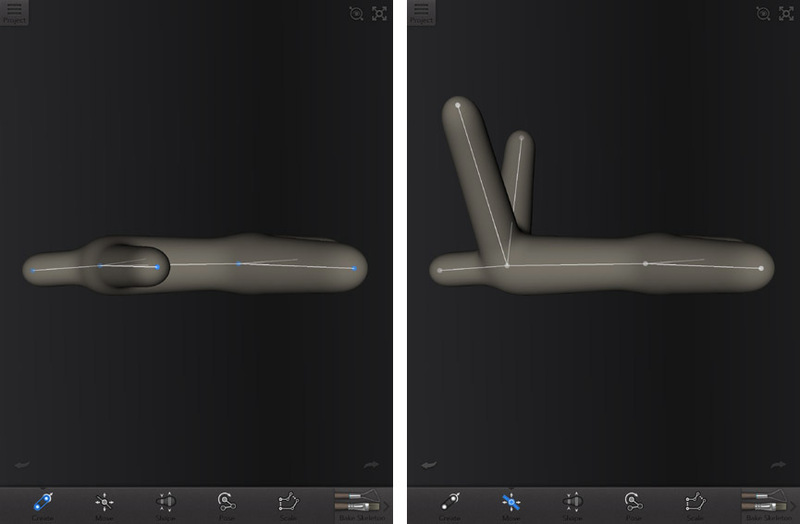 Here it would help if 123D Creature let you delete a limb but that feature is not available. Step 3: Using the create tool, I added an extension to the eye stems and a first limb which I placed centrally on the snail’s body. This serves as the basis for the snail shell. I extended the shell in width by adding one pair of limbs horizontally across the back and another pair orthogonally to the first. 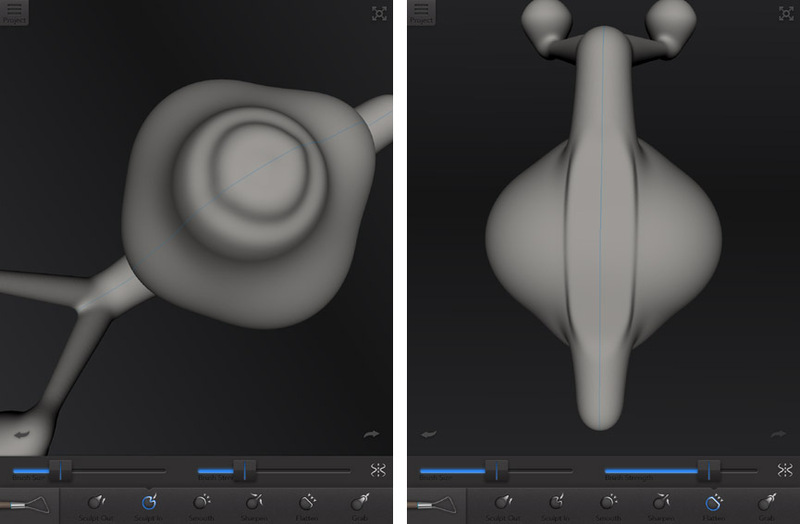 Step 4: With the help of the shape tool I then started turning the skeleton into something that starts resembling a snail: I thinned out the eye stems towards the top but thickened the newly attached limbs to form the eye balls. 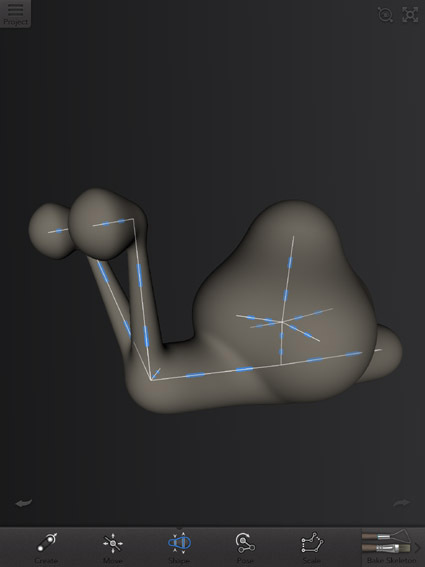 I also applied the shape tool to all the limbs which make up the snail shell, thickening and tweaking them until I was satisfied with the result. Step 5: After baking the model needed a bit more sculpting to work out the finer details. I first added some grooves to the shell to make it look more interesting. This took a bit of trial and error but I ended up getting best results by working in top view and by leaving the symmetric work mode enabled. Step 6: By changing the settings on the sculpt-in tool I then added the mouth and worked some details into the eyes. Step 7: In a last sculpting step, I use the flatten tool to create a base such that the snail would stand up properly once printed. Step 8: I used the airbrush tool to applied the orange and blue colors. 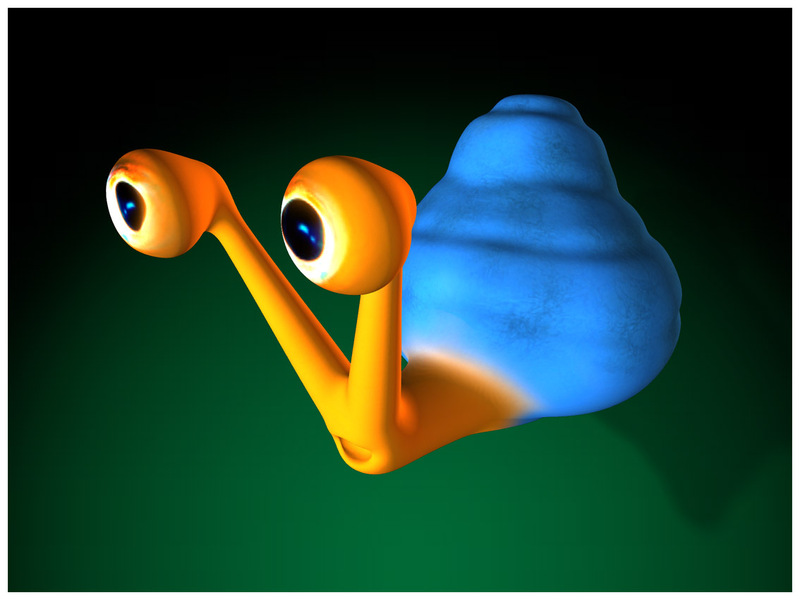 Then I used switched to the texture mode to add the eyes plus some slight texturing on the snail shell. Step 9: Switching to render mode, I selected a background and played around with the light rigs settings until I obtained a result that satisfied me. At this point, I had spend around one hour modeling and sculpting Speedy which goes to show that even somebody uninitiated can get pretty decent results fast using 123D Creature. Since the aim of this project was to get a physical version of Speedy I then sent him off to be printed at Sculpteo (the 3D printing provider that is integrated in the 123D Creature app). Even if you don’t have an account at Sculpteo yet, you can create the account and send off the order all from your iPad. Note that these prices are exclusive of tax and shipping. As this was a test print, I decided to go with the “small” option which ended up costing me a total of 35.77 EUR. Once I confirmed my order I received a confirmation email including my order number. I then sat back and waited to hear from Sculpteo. After only two days, I received an email informing me that my order was printed and on its way. This email even contained a photo of my print which I found to be a nice touch. The box from Sculpteo arrived shortly afterwards. Speedy was nicely packaged in protective material and he made his journey without a scratch. When sending off the creature for printing, I was expecting to be faced with a material choice. However, there is no such choice with Sculpteo and I ended up posting my order not knowing what material it would be printed from. Given that the material choice also has an impact on the colors, I also wasn’t sure if the 3D print would be mono color or not. As I discovered once I receive Speedy, the creatures are printed from powder which is injected by a composite resin. This has the distinct advantage that it allows for multi color prints. Sculpteo actually prints the textures that you applied to your creature. This is pretty cool for when you added features like eyes or a mouth to your creature. 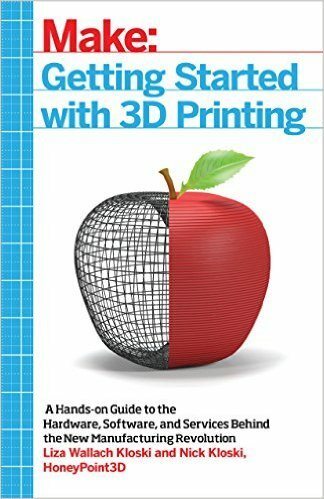 Make sure to make the most of the texturing feature before sending the model to printing. During the design process you should already consider how to make your creature stand up properly. Since 123D Creature is geared towards organic modeling you don’t have a feature which allows you to cut a flat base for your model. I used the flatten tool but that didn’t really have the effect that I was hoping for. Delivery was fast but if you live outside France the only option is delivery via UPS via costs 12 EUR, not exactly cheap. In summary, I am really pleased with the results I got from this quick experiment. 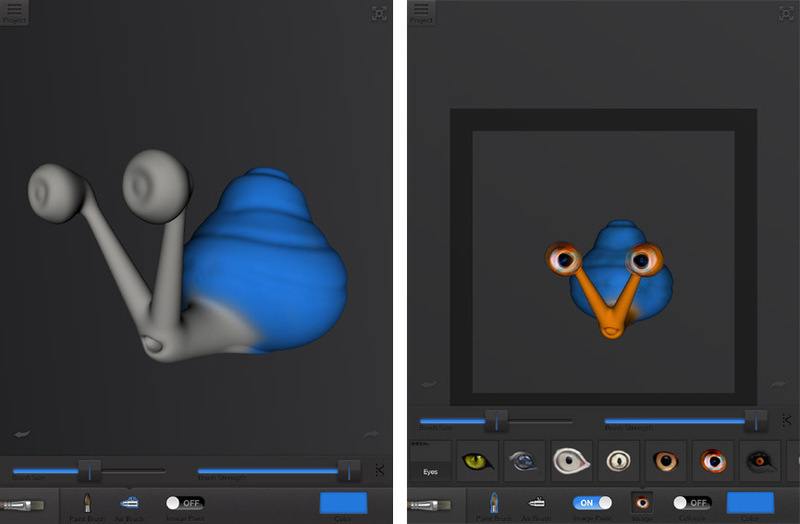 I had already established that 123D Creature is great, intuitive app. Now that I have tested the complete service I can also say that Sculpteo is good and fast 3D printing service. A little more clarity around material selection and shipment options before confirming a 3D print would certainly be helpful. Other than that, the 3D printing service is seamlessly integrated with 123D Creature and the results speak for themselves. 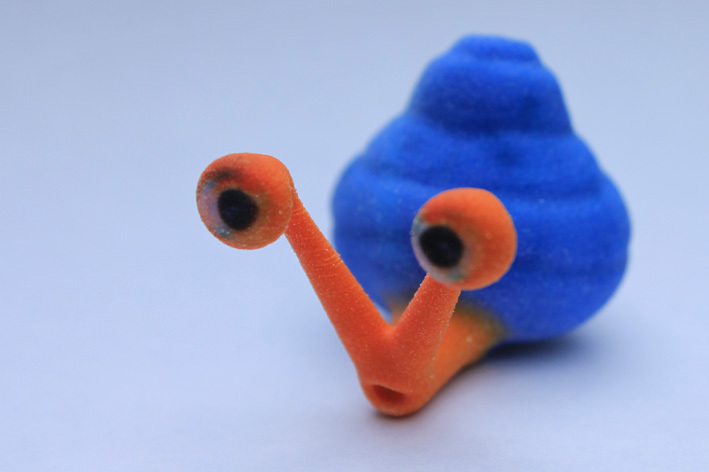 Have you designed a creature using 123D Creature and had it printed by Sculpteo? How did you like the service? Did you get great results? If so, let us know, we are happy to post your results here on the blog. Two of the three objects i ordered arrived broken, very disappointing. Hello Jurriaan, thanks for the feedback. 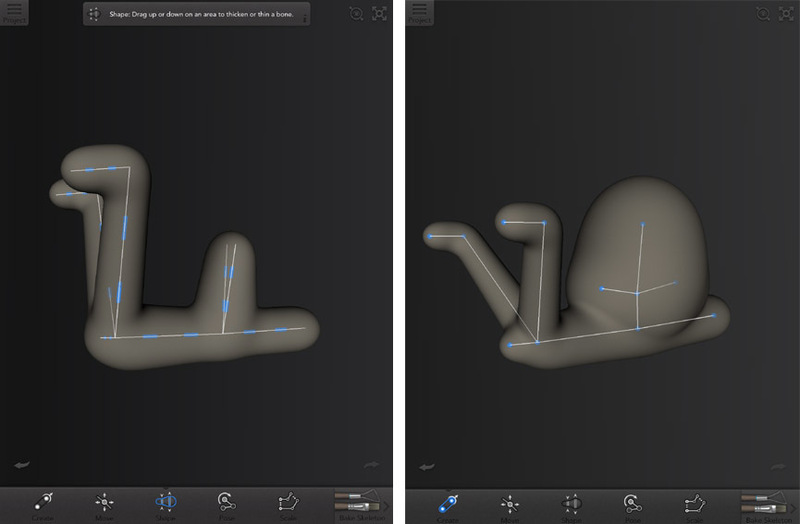 Sorry to hear that you had a disappointing experience with Sculpteo. The items I ordered arrived well packaged and nothing was broken. 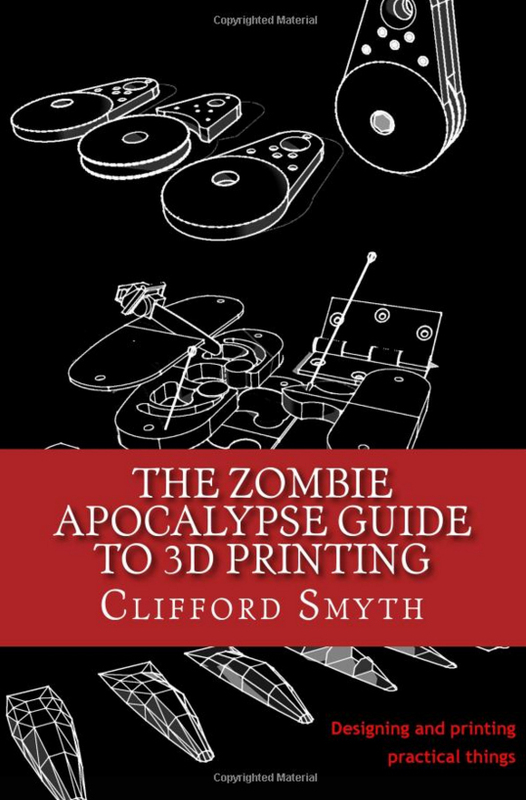 In your case, did you follow up with Sculpteo? Any feedback on their customer service? Actualy The delete, cut, copy and past is avaliable, but you must do it by “joints”. When you’re on “Create Mode” give a quick tap on a “joint” and a sub-menu will apear. Thanks a lot for clarifying that. Looks like you have some experience with 123D Creature, would you mind sharing that?